I was hoping to hear from some other players what thought processes you go through as you contemplate your next move in Go. For reference, I have about half a solid ( 10 hrs/wk of play or study) year's experience. On the rather severe IGS ranking system, I can play at about a 15 kyu level, though this might be improved by better mastery of life and death, as well as more strategic play (being conservative when ahead, rather than pushing for optimal lines of play). "I have a weak point. If Black cuts, then after my move, he'll have me in double atari or put those stones in a ladder." "If I cut here, it's a ladder. Is there a ladder breaker. (visualize zig zag) ... no, near miss. Must extend." "The corner invasion will be worth almost forty points. But descending here is likely sente ... if no response ... (visualize a killing sequence) ... he dies ... ok first descend." I find the words help keep me honest, to avoid deluding myself with poorly visualized sequences and ideas. 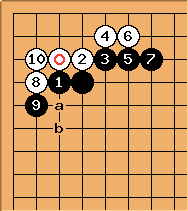 I have not studied joseki much yet, but in the few that I know, I like to give names to each move. Invade. Block. Extend. Hit the head. Block. Extend. Crawl. Extend. Hane. Block. Connect. Connect. I have been prone to blowing huge leads in the late middle game or end game, sometimes even ignoring atari. So I have taken to trying to see my position both as "groups" and "strings" where groups are just stones closely related and likely to live or die together, whereas strings are solidly connected collections of stones (so a bamboo joint is one group but two strings). This helps avoid tactical disaster, and I am often sorry when I neglect to do it. I have not officially studied endgame calculations, but it is not much of mystery to me how they are done. I will often try to figure out how many points I could gain by starting a sente sequence or a gote sequence in some area and what my opponent would achieve by playing there first. But I am too slow to apply this except at the very last moves of the game (perhaps if I memorized more sequences it would help). Usually, I just play mostly by feel, trying to retain sente as much as possible. It would be untypical for me to play an endgame sequence at the edge of the board during the opening or early middle game, but if I feel the mid-game is well under way, I will complete some if it's sente, especially if the stones are enclosed from above. I've read that pros sometimes count almost every move, even in a fight, but amateurs do so much less. I myself try to count whenever there is no immediate problem to think aobut and enough time on the byoyomi clock. I usually count both "enclosed territory" and try to do a projection of the final score based on potential for future development and influence. I know of no sophisticated methods for this, but in the early mid game I would put something about as solid as a wall at about the same value as third lines territory of the same length. I am trying to teach myself to resist temptation when I am ahead and play conservatively. I sometimes try to extend counting/endgame methods to other areas by trying to assign a point value to various moves, again taking sente and gote into account. This is especially true in ko fights. 1. Can I safely make my base bigger? 2. Can I hit a vital point? and the converse questions for trying to kill my opponent. I wish these questions were as easy to answer as they are to ask. I look for throw-ins, false eyes, and Snap-Backs. In corner fights I examine the 1-2 point. Nevertheless, I find myself dying big more often than killing big. I think I could improve by avoiding the kind of situations, like being sealed off or cut, which lead to life and death. I often find my perception of such situations changes quite a bit after the moves are actually made. That is, a cut or being surrounded will not seems like much of a threat (because I can defend or kill the cutting stone with ease, right ?! ), but then when it happens there is some subtelty I have not considered. I have not studied invasions systematically, though (obviously) I like to both make eyespace underneath the invaded position and have center access. If I can't have both, it depends on the position, though I still have trouble telling whether I should be trying for eyespace or just driving a thin spike into enemy territory. I'll generally try to get all the eyespace I can in moves which are "more or less sente". I do know a bit about which moves are good for invading three space extensions, though I do not know all the follow-ups precisely and can not visualize the alternatives before jumping in. I understand thickness, but I hardly comprehend lightness at all. Well, I can often see easy things, like that I should jump into the center as quickly as I can, and not do something slower like an extension or diagonal play, though I miss moves like that routinely too. But I don't really understand how to make flexible formations, part of which can be sacrificed, in my opponent's territory. It always seems like if I even tried I'd lose not just part, but all of my "light" stones. I prefer cruder methods, like reducing from above, or making an invasion underneath (with the intent of saving all stones except some obvious throw-ins) with fairly clear ideas ahead of time about what exactly I want. More generally, when I play well, I think I attend well to concepts of STRENGTH, SHAPE, SPACE, and SENTE. The game seems like a constant conversion of one of these into another. (I enclose too much SPACE for my opponent to accept, he invades and makes a group with little eye SHAPE, I chase in SENTE, enclosing more SPACE and gaining some STRENGTH along the way; finally I overstretch a bit, losing SHAPE to deprive his group of SPACE, forcing me eventually to break off the attack to improve my SHAPE, giving SENTE back to my opponent, etc.) In the end, it's SPACE which matters, but before the other basic ideas are just as significant. Generally, in the endgame, positions will be more or less settled, so both sides will have good STRENGTH (of course, sometimes even pros lose groups late). SENTE may not be very important at the end. Sometimes I spend most of the endgame in gote because I have positions worth defending, but not totally solid, whereas my opponent has a few small chunky groups which resist any sort of attack. But that's usually when I'm winning big, so I'm quite happy to be in gote. If the game is close, one needs to grab sente and hold on for dear life. SHAPE can be very important in the endgame because there is little room to run in defending against a cut. I studiously avoid overplays and rip-offs of all sorts even if I suspect I could get away with them, unless it's the endgame and I am totally desperate. On the other hand, I tend to make really egregious mistakes, especially in matters of connectivity in key situations, often involving life and death. The late middle game/early end game is where I often blow it. So that's a rough overview of the game and how I think about it. Please share your experiences. I would especially love to hear from stronger players who were roughly like me and how they sharpened their game. Tamsin Your article raises lots of interesting points. May I add my $0.02 worth? First, you seem to rely quite heavily on the saw "Strength, shape, space, sente". Second, and going on from that saw, your general approach to selecting moves appears to be a somewhat "top-down process". That is, you judge the position according to pre-conceived ideas and standards. The reverse is to select moves according to a "bottom-up process", in which moves are selected entirely according to an analysis of the needs of the specific position. I'd guess that the ideal mental process combines elements of both approaches, but that you, perhaps, are a little bit too biased in direction of top-down processing. e) other moves (aji, kikashi and so on). I made a string of beads to represent each point on this checklist, and used it in the manner of a rosary to make sure that I considered each item upon each turn. In some ways, this checklist approach benefitted my game. I became calmer (after all, it was as much my "program" playing the game as me myself, and so I felt less emotionally involved), and my thinking was much more disciplined. However, as I'm sure you already suspect, problems emerged. The trouble is that no simple list of priorities can adequately cover the needs of every position. In some cases, thickness is far less important than the aji in a position, while in others, making a kikashi is more urgent than taking an oba (mutually large point). Eventually, I said to myself "checklist, schmecklist" and ceased the experiment. However, this is not to deny the value of having checklists, principles and mnemonics. Indeed, every position is different and ideally needs to be weighed up entirely on its own merits -- but who has the time to do that? Shortcuts and saws help one to deal with localised situations: for example, if a group appears to be short of space, you can start to look for ways of killing it by thinking according to Kageyama's Fundamentals of Life and Death: 1) Reduce its space 2) Vital point. The professionals know all of these things and much, much more. The strong player is able to compare the specific situation with examples from a vast mental library. A very powerful and efficient mental process would involve being able to judge the needs of the position, while being guided by one's knowledge of tesuji, joseki, fuseki, principles, life and death, experience and goodness knows what else. One's existing knowledge would help one to identify what is most important in the position at hand. Just to hammer the point home: you know that memorising joseki makes you weaker, while studying them makes you stronger. This is actually do with top-down versus informed bottom-up thinking. If you learn joseki and play them simply because you know them, i.e., applying them top-down regardless of the needs of the whole position, then there is a good chance that you will be playing entirely in the wrong direction. On the other hand, if you study the joseki (i.e., make an effort to understand the meaning behind each move), then you can apply them effectively: your bottom-up analysis of the needs of the position will tell you in which direction you need to play, but your top-down knowledge of joseki will supply the optimal way in which to play in that direction. In conclusion, I'd suggest that you worry less about what processes you apply, and more about developing your mental machinery. That is, learn as much as you possibly can about the game, about strategy and tactics, and try to apply it flexibly according to the needs of every new position, using saws as helping hands toward this kind of thinking and not as substitutes for it. I hope that all makes sense and proves helpful. For what it's worth, I'm 2k* on IGS at time of writing and 1k* on dashn. Moonprince: Learning go poses special problems for those of us with learning disabilities, so I have added a page to discuss alternative strategies for thinking/learning go. SpecialIssuesInLearningGo. BobMcGuigan: I think it's important to consider other aspects of mental process or attitude than how a position is analysed. For example it is good to be able to let go of mistakes. Everyone makes mistakes in a game, even pros. You may realize that you made a less than optimal move soon after you made it. It is tempting to insist on your mistake and keep going in a wrong way even though you know it's a mistake. This is a sort of egotistical way to play and can't help matters. I think go is a process of trying to find the best move in every position. If you make a mistake you can still keep on trying to find the best moves after that. We need to be able to "refresh" our minds and take the position as it is, mistakes and all, and look for the best move without emotional baggage from earlier errors.